I have a special request, and I need your help. On Monday the names of the Top 10 Influencers in online Alzheimer’s disease conversation will be released. 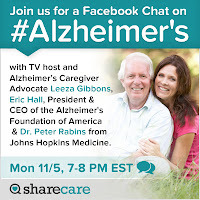 It would be wonderful if the Collective Brain of the Alzheimer's Reading could make its presence felt by joining the Facebook Chat on Alzheimer's disease and caregiving that will be by held Sharecare from 7-8 pm ET on Monday. By the way, if you are reading this, you are a part of the Collective Brain of the Alzheimer's Reading. I am on the Top Ten list that is going to be announced on Monday. Thanks to all of you. I need your help and this is what I am asking each of you to do. If you can, go to this page on Facebook right now -- Alzheimer's Facebook Chat. In the upper right hand corner of the page you will see a button labeled Join, then Going. Click the button and indicate whether or not you will attend. Or, the Alzheimer's Reading Room influenced me. Or, make any comment you think is appropriate. On Monday evening, discussion leaders will include Leeza Gibbons (TV Host and Alzheimer's Caregiver Advocate), Dr. Peter Rabins from John's Hopkins, and Eric Hall from the Alzheimer's Foundation of America. I'll be there and I'll be able to answer questions. This was not a popularity contest. Reach was measured via a mathematical algorithm that measures influence on the Internet. Considering that my full time job was caring for my mother (Dotty), I am pleased to be on the list. However, I am not pleased with the current position. We need our own BlogTalk radio show and more YouTube. We will do that and more in the next year. I am now a designated Alzheimer's expert on the Sharecare website. I'll be able to answer questions as an expert; and also, share my intellectual capital there. Dr Oz is one of the Founders of Sharecare.